Determining the need for adjuvant chemotherapy in estrogen receptor (ER)+ disease can be influenced by pathological characteristics and gene expression assays [i.e., Oncotype Dx recurrence scores (RSs)]. 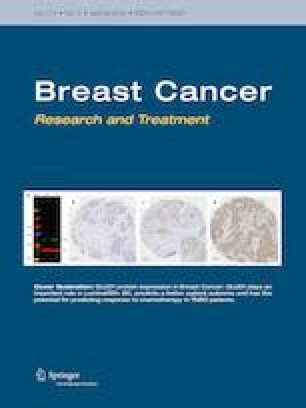 The primary objective of this study is to investigate the relationship between the RSs and pathological markers in younger (< 50) versus older (≥ 50) women with early-stage node-negative ER+ breast cancer. This was a single academic-center retrospective cohort study. Subjects who underwent Oncotype gene expression testing were retrospectively and sequentially identified. 436 Subjects were identified of which 344 were eligible for analysis (133 younger subjects < 50 years of age, and 211 older subjects ≥ 50 years). Pathological data assessed included the progesterone receptor (PR), histological grade (grade), Ki-67, and P53. A multivariable regression analysis was performed using age, PR, and grade as predictor variables for RS. Adjusted R2 was determined. To investigate the primary objective, subjects were stratified based on age, PR, and grade status in that sequence. Within each tumor subtype as determined by PR and grade statuses, the RSs in the younger versus older age group were compared using Student’s t-test and the differences in the 95% confidence interval limits in RS means calculated. Age influence on adjuvant chemotherapy recommendation was also assessed by stratifying subjects based on age (< 50 vs. ≥ 50) and then by RS risk group (≤ 10, 11–25, ≥ 26). Subsequently, the proportions of younger versus older subjects within identical RS risk groups who were explicitly advised by their oncologist to proceed with chemotherapy as documented in their electronic health records were compared using χ2 test. Based on the multivariable regression analysis, the adjusted R2 was 0.229232 and RS was found to be independent of age (p = 0.7169). Between younger and older subjects with tumors with similar PR and grade pathological features, the differences in the RS were insignificant (p > 0.05). Chemotherapy was recommended in younger versus older women, in 0% when the RS was ≤ 10, 39% and 40% when the RS was 11–25 (p = 0.82), and 100% and 98% when the RS was ≥ 26 (p = 0.51), respectively. The relationship between pathological features and RS is consistent irrespective of age; therefore, models predicting RS may be applicable irrespective of age. The authors would like to show their gratitude to Kelly Kindy (Robert H. Lurie Comprehensive Cancer Center, Northwestern University Feinberg School of Medicine Chicago, IL USA) and Aisha Brownlee (formerly at Robert H. Lurie Comprehensive Cancer Center, Northwestern University Feinberg School of Medicine Chicago, IL USA) for their assistance with database building. Data analysis was funded by the Northwestern Medicine Enterprise Data Warehouse (NMEDW) Pilot Data Program NUCATS Grant UL1TR001422. Cesar A. Santa-Maria has received Research Grants from Medimmune, Pfizer, and Tesaro as well as served on an Advisory Board for Polyphor and Genomic Health. The rest of the authors declare that they have no conflict of interest. Chart reviewing of existing electronic health records belonging to our human participants was in accordance with the Ethical Standards of the Institutional and/or National Research Committee and with the 1964 Helsinki Declaration and its later amendments or comparable ethical standards. Institutional Research Committee waived the requirement for obtaining informed consents from study participants as it is a retrospective study using existing but de-identified health records.